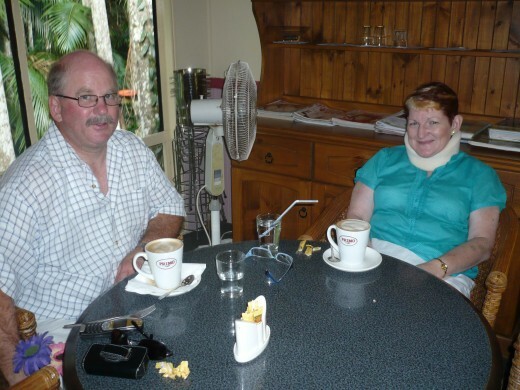 I received a lot of support as I was recovering from my stroke. I had a neck support I had to wear because my neck was bad then and it is worse now. 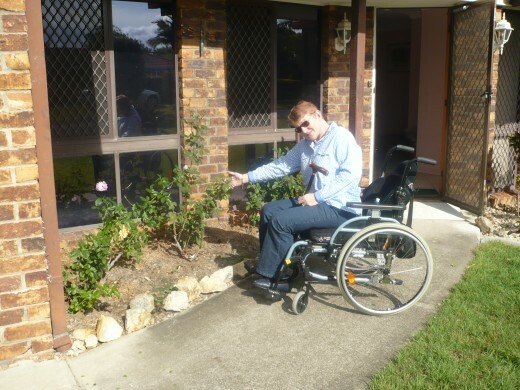 I am in a wheelchair more these days because my illness is getting worse. I love to go outside when it's fine just to take in some fresh air. It's better than being inside all the time. Good for Vitamin D which I have a low amount of. 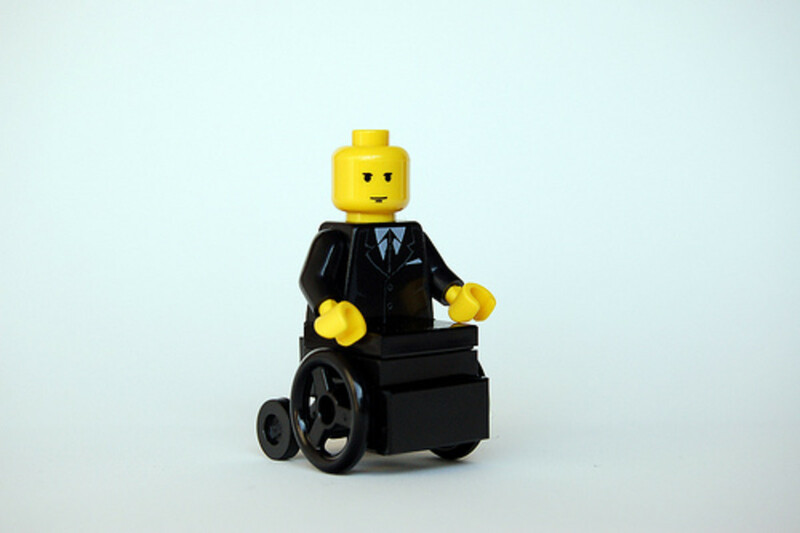 Being disabled can give you all sorts of problems. For one thing if you can't walk very well you have to use a wheelie walker. Then as things progress and you are unable to walk very far without having major concerns, you then have to graduate to using a wheelchair. Well, that's where I am now. In fact I have been using my wheelchair now for about three years. Unfortunately, though because of my illness Multiple Systems Atrophy, I have to be pushed by someone else. I don't have enough strength now to do much at all with my arms and each day I have noticed this getting worse. Richard, my husband has been there for me every step of the way. The good ones and also the bad ones where the steps gave way completely. He'd be there to help put them back together again so I could start going back up them again in the right direction. Which Brings me to my next item on the agenda. Just my little joke there.Well you have to laugh about these things or you will cry and I don't know about you, but I would rather laugh than cry all day. Anyway this has made it very hard to be able to do a lot of the things that I used to do. The things that I am referring to in particular are exercise. I love to swim in my pool and up until a few months I was doing this quite regularly with the help of my husband. It was great because I not only got a lot of pleasure from doing swimming but it was of great benefit as my muscles are atrophying. There was just a big problem in the way now because of the muscles I was not able to lift up my right leg and therefore couldn't safely climb into the pool anymore. For a long time now I've had to rely on Richard to lift my legs one at a time so I thought there has to be a better way, but what? Then I found what I had needed all alongl. A way to keep up my swimming without having to rely so heavily on others. Me in the pool doing exercises after stroke. Holding rail for assistance while doing exercise. Here I am receiving assistance from my physiotherapist. It was a big help have her to assist me with my exercises after my stroke. It is also very important now more than ever to exercise with Multiple Systems Atrophy to keep my exercises up. I loved to swim when I was younger and that hasn't stopped as I have grown up.In fact I have been swimming all my adult life without any difficulties. I use to get up each morning and have a swim in the pool,do a few lengths and then when I was tired or cold or both, that would be my cue to retire and get out of the pool for a rest. Now as things are progressing it is far harder to get in and out of the pool so now I have had to get used to more help in getting in. For example, we have installed a rail to hold onto that will assist me when I am walking down the steps into the water. This has been a great help for me as now my balance is so bad that I need something to keep me steady. I also have had assistance from my physiotherapist as well in the pool. It is important after a stroke to have regular exercise and hydrotherapy is considered to be the best way of helping. My legs were not good at all for a long time and with the exercises in the pool, I was able to stand. 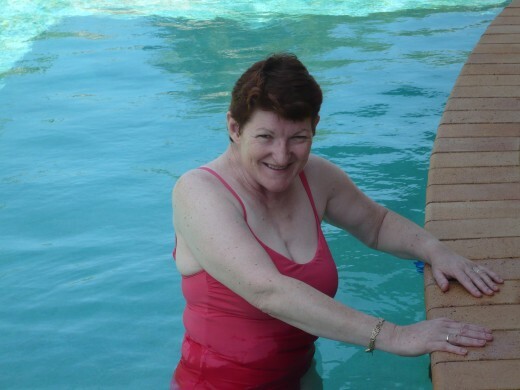 My physiotherapist came at least once a week and it made such a difference to my recovery to have her in the pool with me, as the picture shows. If anyone reading this hub is recovering from a stroke or has any other illness that has robbed them of the ability to move very well and in particular their legs and arms, then this is the best way to exercise. I try to swim as much as I can but my physical wellbeing is also affected by the Multiple Systems Atrophy which is incurable but I will continue to exercise because it just makes me feel good in mysel,f even though I know that in the long run it isn't going to change anything. I was having more and more difficulty trying to get into the pool. My legs have become so weak now that it is just too hard to walk down the steps even with a rail. Because of this latest problem I had had to find out more about what was available to assist me into the pool. My physiotherapist suggested a place that we could go to that made pool lifts. We were also in the process of installing a spa at that time so we we thought that it would be a great idea to look into buying one of these as well. We decided to wait till the spa had been installed before buying one of the lifts suitable for a spa. I didn't think that it would be too long before we'd be back as there wasn't much to do until our spa would be ready to fill with water. I have put a couple of pictures of the model that we decided to buy to assist me into the pool. As you can see, it is a very efficient method and quite a nice looking piece of technology. When I think back to the days before these wonderful pieces were invented, it must have been very difficult for those who were disabled in some way to get into a pool. 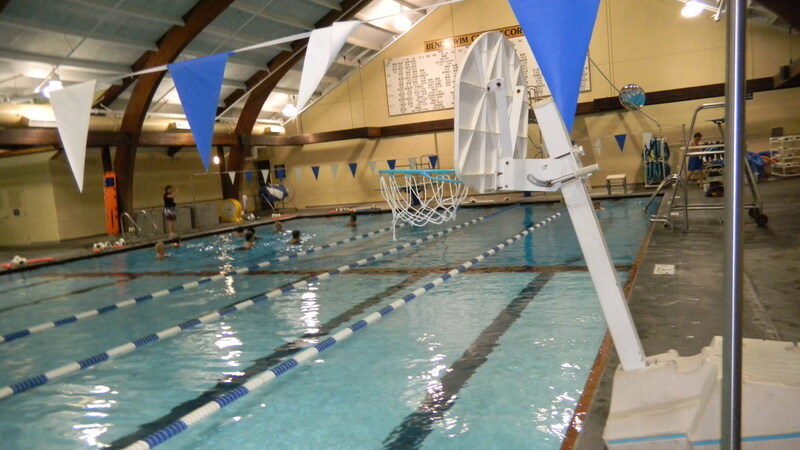 The Pro Pool Lift is an ADA compliant specialty pool product which is used to provide access in aquatic therapy and commercial water recreation. The Pro Pool Lift is arguably the most technically advanced pool access lift available on the market today. The Pro Pool Lift features a compact design, rechargeable 24 volt battery, stainless steel construction, and a UV resistant powder coat finish. In addition to the low-profile design, the Pro Pool Lift does not intrude into the pool when NOT in use and includes submergible remote control handset, dual flip up arms, flip-up footrest, an adjustable lap belt and optional headrest. If you are looking to keep your deck clear and anchor free, then incorporating this Portable Kit will allow you to place the Pro Pool Lift almost anywhere on the deck! The 24V battery unit lifts up to 450 lbs. Aqua Creek's Power EZ Lift™ offers battery powered lifting capabilities to 400 lbs in an affordable sling style seat. Easily portable for storage and/or relocation to another pool area. Stainless steel construction and a UV resistant powder coat finish ensure long life and corrosion resistance. Anchor, battery and charger included. Electric model pool hoist allows the caregiver to be positioned beside the patient at all times because of the remote hand controller. This is the Pro-Spa Lift 40 is the spa lift that I ended up buying. It is such a wonderful apparatus for getting into the spa.It makes getting in a breeze believe me you really have to try it. If you need one. 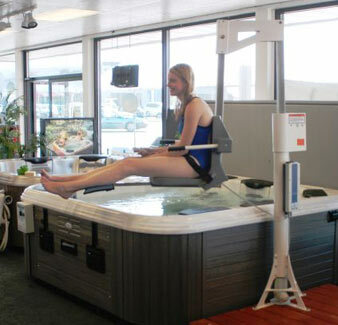 If you need to buy a spa lift for yourself then I recommend that you have a look at the video I have here. It does a great job of describing in detail all about this wonderful piece of technology. I never dreamed a few years ago that I would be needing one of these to put myself in our spa. However, here I am in exactly this position. I have to admit I am not the model in the photo, I'm not that good looking so I have a stand in. Well as you can see now from what I have told you and, as I have discovered, I can get not only in my pool with little help, but also in our spa which is such a wonderful thing for me. Up until now, I have struggled with both and took me the longest time just to climb over the side of the spa one leg at a time. Now, with the flick of a switch after you get into the little seat, it's a matter of having someone lower you down into the spa seat. So much better, believe me. The pool is just as good. I don't have to take my time one step at a time hanging onto the rail. Now I can be assisted into the seat and then someone moves the pole over to hang over the pool. You get in, get comfortable and wham, bam, thank you maam you're lowered into your pool standing or lying or whatever you want. The main thing is you are in and it was just so much easier thanks to technology. What will they come up with next? I have just got home from hospital but I have to return the have surgery again or at least the one I should have had. It had to be abandoned because of com. The second night I had a cardiac arrest and they had to call a code blue, if you know what that is. I then went back to the Intensive Care Unit. I am so glad that this was very helpful and informative for you. I can tell you honestly it certainly does give a lot of spirit back to you soul when you just feel like it is the end of it. You find a way to get back in the pool and spa and it is so much easier than anyone would ever think until you are in this position. I would love to hear how you get on with this Best of Luck Beautybabe. I will share this info with my fellow Zebras (those with Ehlers-Danlos Syndrome) as many have lost much of their mobility too. I'm so glad that you've found a way to enjoy the pool and spa - good not only for the body but the spirit too! difficulties. It makes me feel more grateful for the health I have. The pool equipment is marvelous.